If you’re looking for a pair of heated motorcycle gloves but you don’t want to spend too much money you might want to consider liners. Heated Motorcycle Glove Liners are a great way to get the benefit of heated gloves without paying a fortune. This pair of liners from VentureHeat only works if connected directly to your motorbike’s 12V battery so keep that in mind. I’ve been putting a lot of focus on heated glove liners lately because I really feel like they’re a good alternative to buying a fancy all encompassing pair of heated gloves. The reason I say that is because not only are they much cheaper than buying a pair of heated motorcycle gloves that are insulated but they’re just more practical because most people already own a pair of insulated regular motorcycle gloves that you can wear over top of liners. So if you already own a pair of motorcycle gloves that you’re happy with and that offer good comfort and protection, then you might be better off getting some heated liners to wear underneath. These VentureHeat 12v liners are a great option. One cool thing about them is that they work well with or without a pair of gloves over top of them. If the weather is cool but not too cold then you can get away with wearing just these gloves with the heat on. This is a nice option because they’re so thin that it barely feels like you’re even wearing gloves. The only problem is that they don’t offer very much protection all on their own. If you’ve never installed a heated accessory on your motorcycle before don’t worry because it’s really easy. Here’s a quick video showing you how it’s done. Easy right? So once you’ve installed them you’re ready to go. I often just keep the liners in a pouch or bag and break them out anytime my hands start to feel cold. 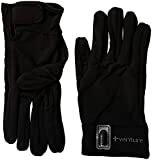 Another great reason to buy these gloves is their compatibility with other VentureHeat products. If you already own a VentureHeat Jacket or Pants then you won’t even have to install the battery harness. You just plug these gloves right into your jacket or gloves and you’re ready to go. So these gloves are made with what they call Xtreme Comfort Technology. What this means is that they use ultra-thin heating panels instead of bulky heating coils that a lot of other heated gloves use. They use alloy fibers to distribute the heat and it makes for a much more flexible glove with great dexterity. Aside from the great dexterity and flexibility, they’re very comfortable because you can’t even tell that there are heat elements in them when you wear them. The material is 86% Polyester and 14% Spandex so they have a very stretchy and flexible feel to them. You should make sure that they fit snug on your hand so that they’ll fit under your other gloves easily. They’re so light and thin that it barely even feels like you’re wearing gloves at all. That is of course until the heat starts pumping through them. The heat draws a total of 1.3 amps and provides more than enough heat. The heat runs along the perimeter of the palm and all along each finger with even heat distribution. These gloves will be hot enough on their own with the heat on in mild temperatures but when it gets colder out you’ll want to put a pair of insulated gloves over top. Even if you just have a pair of leather gloves over top that will help a lot because these gloves on their own do not break the wind at all. The leather will help break the wind as well as provide some extra insulation to keep that heat in. So on their own they aren’t crazy warm but when worn with other gloves they can be extremely warm. There is however only one setting. On or Off. There is an option to buy a switch for it but I think most people are satisfied just unplugging them when they want the heat off. For comfort I’m giving them a 19/20 and for warmth I’m giving them a 17/20. In rainy weather these gloves won’t keep your hands dry at all. The water will just go right through them. They aren’t designed to be waterproof nor are they advertised that way but it won’t wreck them if they get wet so you don’t have to stress if they get a little bit wet by accident. It’s not exactly fair if I give them a poor score like 10/20 in this category because they aren’t really designed to be worn all on their own. Since these are designed to be worn underneath gloves you can simply put a waterproof glove overtop of them and then you’ll be good to go. So in a way these gloves are good for rain if you have the right shell but again, I can’t give them a score like 20/20 in this category because they require a shell to make them waterproof. With all of this being considered I’m going to meet close to the middle and give them a 16/20 in this category. I’ll stand behind the quality of any VentureHeat product. I’ve used and tested many different pairs of VentureHeat gloves and I know that they’re all high quality. These are no different and you’ll be able to feel the quality right away when you put them on. They stand behind their products and they’ll give you your money back within 30 days if you’re not happy with them but I just don’t see that being necessary. As with the water resistance category this one is a bit tricky. Since these are designed to be worn underneath other gloves they’re really as safe as the shell gloves you wear with them. With that being said, they don’t provide much protection at all on their own. Since they’re made of thin polyester and spandex they will not stand up to any significant road rash. They do however have a very nice adjustable cuff that will keep the gloves on tight so they won’t come off in the event of a crash. I’m giving them a 16/20 in this category much for the same reasons that I gave them a 16/20 in the water resistance category. Much like other VentureHeat gloves these one fit very true to size. I would recommend you check out our Sizing Guide just to make sure you know what size to order. It is very important that these gloves are fitted quite tight so that they will go underneath other gloves without bunching up so keep that in mind too. As a liner these are pretty much as good as it gets. You know you’ll be getting a good quality product that has a well known name behind it. The comfort is great and the warmth is too. For a very reasonable price you can have toasty warm hands while riding any time of the year. They aren’t touchscreen compatible which might be a factor for some of you. If that’s the make or break for you then I would recommend the Glovii liners instead. I truly believe that these gloves will satisfy just about any rider out there. Thanks very much for stopping by today. If you have any questions or comments please use the box below and I’ll respond ASAP.